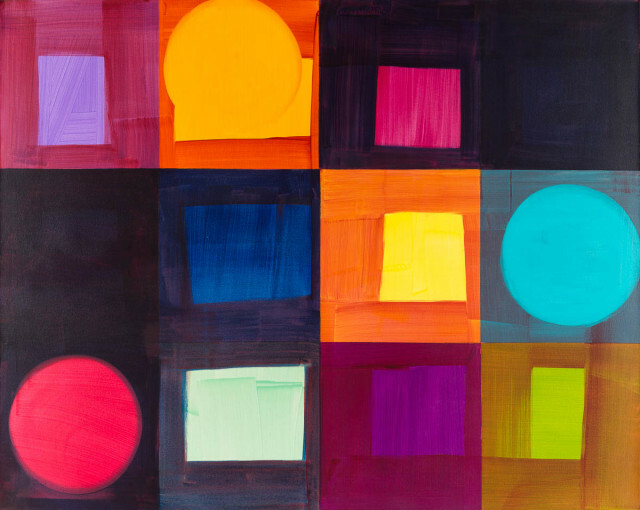 Mali Morris explores in her abstract paintings how colour can construct luminosity, building complex layers of rhythmic pictorial space; she investigates the language of painting, its ever-changing expressive possibilities, and how it could relate to our experience in the world. Born in 1945 in north Wales, she graduated from the University of Newcastle upon Tyne (Fine Art BA) in 1968, and the University of Reading (MFA) in 1970. Her first major exhibitions were at the Serpentine Summer Show 3, London, 1977 and the Ikon Gallery, Birmingham, 1979. Since then she has held over 35 solo shows worldwide, and has been included in numerous group shows, in London at the Barbican, Hayward Gallery, Serpentine Gallery, Whitechapel Gallery, at the Walker Art Gallery Liverpool, Whitworth Gallery Manchester, Museum of Wales Cardiff, as well as a number overseas. She has received awards from the Arts Council, British Council, DAIWA Anglo-Japanese Foundation, Elephant Trust, GLAA, the Lorne Award and the Sunny Dupree Award.